Some people take parenting advice with a grain of salt, and depending on the source I do too. 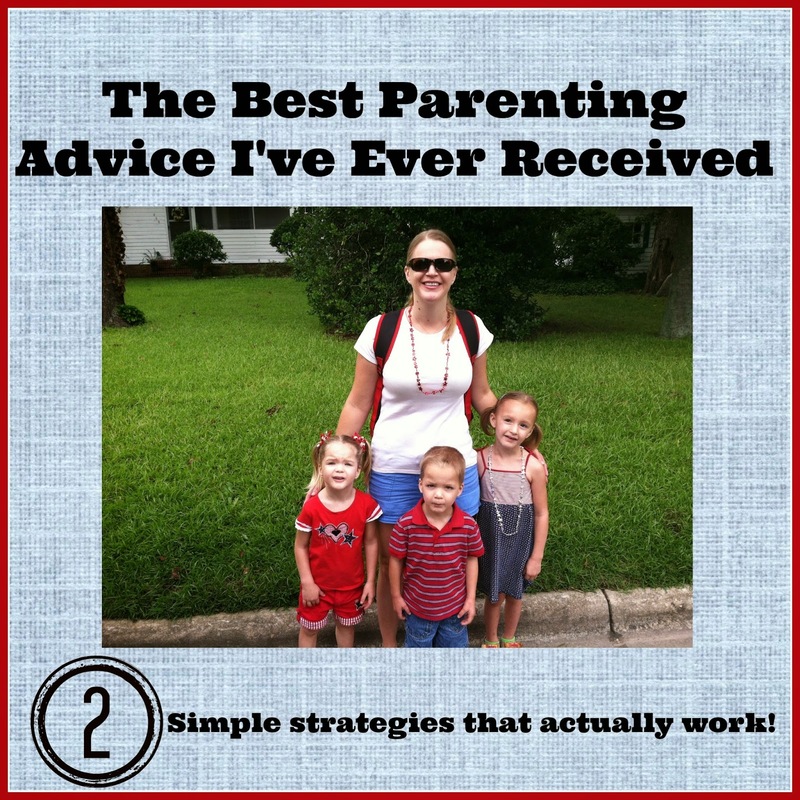 Usually I'm very open to listening to people's advice since I believe other moms have great advice and I want to learn from them. However when I'm wearing my sassy pants and my kids are having an epic meltdown in public, the advice doesn't even make a blimp on my radar. It's all in the timing friends! I've received some great advice over the years in parenting from sleep training to potty training, but two pieces of advice stand out like diamonds in the rough. As my children get older and I'm focusing more on raising adults instead of children, I refer to these two parenting tips more and more. Never do something for a child that he/she can do for themselves. At my baby shower the other moms wrote down parenting advice for me in a book. My cousin gave me the advice to never do something for my child that she could do for herself. At the time it didn't really sink in, I was about to have a newborn baby who would need me for everything! Now I know how fast the baby phase passes and that advice makes perfect sense now. From a young age, the kids were expected to help. They all put away their toys, in the beginning I would put away 20 toys for their one toy but eventually they learned how to do it by themselves. My kids know at the end of the day, they are responsible for putting away their toys. It doesn't stop them from making epic messes, but it does take away the battle at the end of the night. Well most of the time anyway. Recently I taught them to unload the dishwasher, which they love to do. I don't know how long that will last, but I'm going to enjoy it while it lasts! I'm going to cherish this picture when she's a teenager! By not stepping in constantly and doing something for my kids because it's faster or easier I'm teaching them to be responsible and independent. This method takes endless training and patience, but it is worth it in the long run. Don't worry when we're running late, I'm tying shoes and helping with jackets. There is a time and place for mom to step in and hurry things along; like when the bus is coming in 2 minutes. We had a guest speaker at my MOPS meeting who was giving parenting advice a few months ago. She is a college professor who told us story after story of parents who would call her asking if their kid could have an extension or excuse them from a test. That blows my mind! I can't imagine asking my mommy to call my college professor to help me. Our speaker explained that these kids were reaching college without having to solve any problems. Mom and dad always stepped in anytime life got hard. Also, that learning to solve your own problems needed to start in the preschool years. (Crap, another thing I wasn't doing) Don't worry it wasn't a lecture, she was there to give us some strategies to teach problem solving to our kids. She told us when our kids have a problem we need to ask them "what are you going to do about that? In the beginning we would have to help our kids with the wording. Here's a great example of using this strategy with a young child. Kid - I can't find my shoes. Parent - What are you going to do about that? Parent - You could ask me if I know where your shoes are. Parent - Yes, they're by the front door. The goal of this strategy isn't to stop helping your child, but to get them to start thinking how to solve problems. It's all about shifting their thinking from mommy solve my problem to mommy I have a problem can you help me with it? Just that little switch in thinking will help young children learn to problem solve. You will literally have to give them the words in the beginning, especially if they are young. Eventually they will learn what to say and come to you asking for specific help instead of telling you their problem without a solution. For older children you give guidance instead of direct help. Simply asking my kids "what are you going to do about that" has made a huge difference in my home. For months I've been giving them the language to solve sibling disputes and they are starting to use it on their own and with friends. Of course my kids still need my help occasionally; but they are solving most of the dreaded toy disputes on their own. Hooray! There you have it, the two best pieces of parenting advice I've ever received. What is the best parenting advice you've ever received? My kids are 16, 12, and 6 and this is something I've done with my youngest from day one, and really wish I'd done with the older ones. He is so independent and loves doing things for himself where the 16 year old still defaults to "hey mommy" all the time! It's great that you're starting young!